All prices are in Canadian dollars. We use the total number purchased (ELM712P + ELM712SM) for the calculation. 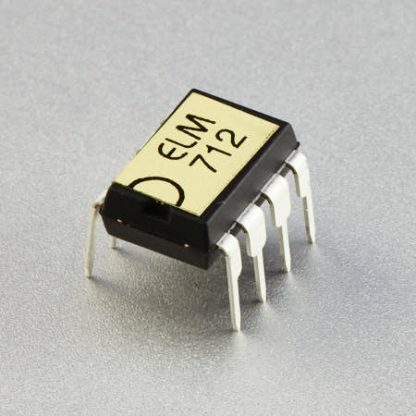 The ELM712 is a handy circuit for controlling up to five LEDs in novelty devices. One pushbutton press is all it takes to initiate about 15 seconds of LED activity, before the circuit reverts back to its very low current standby mode. All of the logic required for circuit operation is contained wholly within this 8 pin integrated circuit. Normally only a pushbutton, the LEDs, and a battery are all that are needed for a complete circuit. At higher voltages, a single current limiting resistor may be required to limit LED current. The ELM712 drives each LED output in a sequential fashion, at approximately 10 Hz. By only driving one output at a time, peak current and thus battery requirements are reduced.